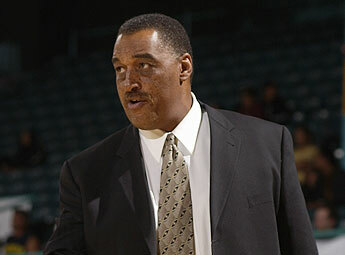 (9/18/54 - 2/22/07) Basketball legend and Coach Dennis Johnson was a good friend of mine and the moment that I heard that he had collapsed I was showing my daughter Jasmine where she could get a copy of some necessary documents for the formation of our new limousine enterprise, Austin Private Car. For those of you that don't know, Austin Cab is a sponsor of the NBA Developmental League Austin Toros and we advertise on our cabs to promote the team. I am also a season ticket holder with reserved seats right behind the home team bench and scorer's table. There've been many times where Coach Johnson would relate to us with a look, comment or gesture as we cheered the team on. called me as I was parking to inform me of the unfolding saga. He asked if I could get a cab or limo to pick up Dennis' wife Donna and bring her to the hospital. He added that they were having trouble getting her to return their calls and that she lived in Dripping Springs. I doubt that Mike will ever forget my reluctant response when I remarked, "You want me to dispatch a TAXI all the way to Dripping Springs and you don't even know if she's at home? Are you crazy or do you think I am?" In retrospect, especially during THOSE events on THAT day, I suppose that in most ways we all were. Mike stated that he would call me back when he knew if she was there and that's when I decided that my daughter and I would have to make our DPS venture some other day. As I returned to my office, daughter in tow I called Assistant Manager Vernon Crayton and told him to head toward Dripping Springs in one of my personal Private Cars to pickup Dennis' family. We didn't know the address but I would get it. While Mike was telling me that Dennis had collapsed in front of the Convention Center after practice, my thoughts raced back to January 12 and 13 to Los Angeles, CA. when the team had invited some of the sponsors to the cross-state game between NBDL teams Austin and LA. held at the Staples Center. The Staples Center is a beautiful huge arena where the Lakers play. Between the Toros game yet prior to the Lakers game the arena played clips of DJ on the big screen to honor his presence, which I found to be classy. They gave us some decent seats but I didn't stay for the entire game because I felt exhausted. Truthfully I was falling asleep during the 1st quarter sitting between my friend Royce Dennis and some Jamaican-looking Lakers fan that made my cop radar go haywire. Translation: I smelled the weed on his clothing and hair and I couldn't stand it. I decided to return to the hotel before half time and get my rest. Plus I was basically unimpressed with either team due to the fact that I am a die-hard Spurs fan. That next morning Mike, Rick, Dennis, Kris Clack (who had hurt his knee), Butch Kunco, Butchs' brother Jay, Royce, Dr. Karla Frazier, her husband, the 2 DosXX people (I never processed their names) and I were talking while relaxing casually in the lobby awaiting a van to the airport. We all were different people from different walks of life who shared a common bond: The Austin Toros. It was a beautiful feeling looking at all these strangers and feeling at home with them. Who among us would've imagined that a scant few weeks later Dennis, as a former pro athlete, would have a massive heart attack, collapsing and dying like that? I called Kris on his cell to ascertain what the real deal was. Kris played on the team and he would be able to give me a better perspective of what really had happened. Kris offered details that Mike had omitted, including the fact that paramedics were unable to revive Coach Johnson even as they shot him with adrenaline while giving him CPR outside on the sidewalk. As a former cop, I knew deep down that even if Dennis made it, after that kind of time "out of it" where they couldn't revive him and a shot to his system failed to "move" him, he would never be the same guy that we all knew. I called Toros VP Rick Epstein who informed me that Donna had packed her family in their Black Suburban and although they had arrived at the hospital, it didn't look good for Dennis. It didn't look very good for Vernon either as he sat near the Polo Club near Sawyers Ranch Road awaiting an address. There was so much going on so quickly that it would be another 20 minutes before he would get word to come back to Austin empty. I had never met Dennis' wife prior to that day although he had spoken of his love and respect for her many times in our past conversations. We talked about a lot of stuff that I will never repeat yet suffice it to say that just about every action that Dennis was making concerned the best interest for his wife and children. Dennis was the epitome of a selfless individual and in many ways I saw him as a brother moreso than a mere friend. Since Donna was already at the hospital Mike called and expressed concern about getting her and the kids transported FROM the hospital due to the unfolding distressed nature of events. Mike asked if I could arrange for a driver to drive them home in their Suburban and another to follow them in order that they get home without further incident AND have their car there. I figured that since Vernon was already out there, he could drive Ken back if we were able to complete the favor for Mike. Mike had a thoughtful plan for their safety and it highlights the kind of guy HE really is, which is more than I can say of some other people I've known in similar positions in the past. Mikes actions speak volumes about him and I am glad we are friends. Those 25 minutes after the first call from Mike literally went by in a blur. I am sure that I broke a few traffic laws getting to my office to drop my daughter and then picking up Operations Manager Ken Grant who had agreed to be the other driver. Truth be told, although I couldn't find a regular driver for such a delicate task in such short notice, I knew that it could all work out like clockwork because I had already sent Vernon in their home direction, and he was awaiting instructions patiently. As I turned off Red River into the hospital driveway, there the entire front office staff of the Austin Toros milled near the Brackenridge Emergency Room. As I turned my Tahoe around I spotted Mike standing near the curb, apparently agitated. There were a few other people I knew that were milling all around the sidewalk and street, everyone with an opinion of what to do but no one doing anything. Without a doubt, everyone was still in shock. I asked Mike where Dennis' wife was and he stated, "She doesn't want any help and is driving home herself." He threw up his arms in disgust when he looked at me because he knew the trouble I had gone thru to be there. He added, "Her pastor is walking her to the car right now," pointing toward the 15th and Red River direction. I looked at Ken and drove off after her. I couldn't believe that I had dropped everything I was doing including pulling 2 company employees off their job and going to extraordinary measures to help provide comfort and safety to my friends' wife... and here she was storming off?!!! I wasn't having it. I caught up to her at IH35 and 15th streets beckoning for her to roll down the window. I told her WHO I was and WHY I cared, explaining that we would gladly assist getting them home safely. She declined shaking her head and wording "No" and drove off without even so much as a thank you. Flabbergasted I looked at Ken and we both discussed how some people take other people for granted, which was how we both felt at that moment... How I still feel about it even today. I won't lie, I don't remember where I went at that point except that I took Ken back to work at Austin Cab Company and called Vernon to tell him what had happened and to return to base. I figure the excursion to assist had cost me over $300 all-told and it went unappreciated at that. The days that followed were some trying times for all of us, filled with uncertainty for a plethora of reasons. I was worried about what was next for the Toros because they had built this team completely around Dennis. 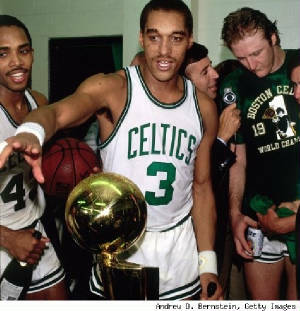 This was Dennis Johnson’s team! Plus there were two games scheduled for Friday and Saturday night with two different teams and I had to wonder about the logistics of transporting them to and fro all the while in trying to deal with this sudden tragedy too. I had agreed to let my company transport the visiting teams not only to and from the airport but also back and forth from the hotel between practices and games too. I had offered a DRIVER if they got a van but since no other business had stepped up to donate a van, it kinda-sorta fell back on me. I agreed to help because of several conversations that I had with Dennis during and after the first season. They knew that being responsible for the transportation of visiting teams was a nightmare and they were absolutely correct. I knew that the task of transporting the visitors for basically no financial remuneration was daunting but I felt that I could make a difference so I decided to try. Plus I had given Dennis, Rick, Mike and majority owner David Kahn my word that I would help and they had given theirs to me... something between friends that I suspect many people likely waffle on when the promise starts tearing a hole in their money pocket. Then they try to back out and unravel their promises at that point I am sure which generally always shows the sift between men and boys. Looking back on what happened over 4 months ago this past February, when the sports world was shocked by his sudden demise, I still think about the fact that I didn't think I'd even like Dennis in the beginning. He was too quiet for my tastes and hard to get to know. Plus I felt that he was probably too lenient with his players and maybe THAT was the main reason that the Toros were losing games that should've been won, I thought. I found out first-hand that I was all wrong about Dennis when Mike asked that I send a driver to take Dennis to the airport from the Triangle Apartments on Guadalupe at Lamar for an early morning pickup last summer. Here was a guy that I didn't really know beyond a cursory hello and a smile that was an integral part of a sports team that my company Austin Cab was committed to help succeed. Here was a guy that I wanted to know better, if for no other reason than to validate or debunk my jaded opinion of his athletic character. So instead of allowing a cab driver to transport him, I got up at 4:30 AM, jumped in my personal car and drove Dennis and his big bags to the airport myself. We had a fantastic conversation about everything that matters including his family and mine as well as my wrong opinions about his coaching style. Yes I told him the truth and why I thought it. I am always straight up, you know. I was impressed that Dennis astutely understood where I was coming from when he told me that he felt that I am one of those people who hate to lose... just like him. The man understood me. I suppose that in many ways, I had misjudged him because he was such a good man when I met him who carried such an athletes reputation from when I didn't know him. So naturally I was wrong and there's a lesson in all this somewhere I am certain. Does that make any sense or what? Many of us perceive sports figures with fame and fortune of having loose women hanging off them all the time and we also see them as thinking they are better than the rest of us mere humans, big-headed and full of themselves. We are probably WRONG AS WEARING 2 LEFT SHOES but we still have this perception. Dennis was definitely not anywhere near like what I had imagined when I didn't know him and when I realized this truth in speaking with him, I told him of my misjudgment and asked his indulgent forgiveness, which he granted. Dennis, for all his fame, was humbled and it made every conversation that we had thereafter, just a little more valuable and special to me. I'm going to miss my friend and no visit to that arena will ever be the same for me because no matter who is sitting in the coach's chair or walking up and down the floor, the shoes they want to fill were just too big.